Roosevelt Island in New York is located on the East River. The island was named after former president of the United States, Franklin D. Roosevelt and belongs to the district of Manhattan. You can get there by cable car, subway or ferry from Manhattan. 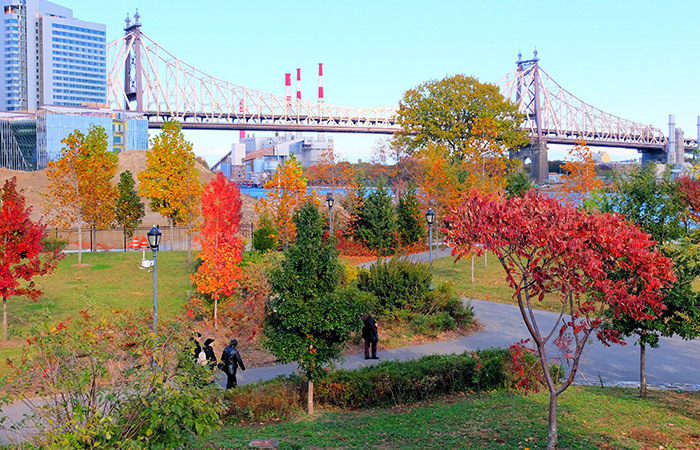 From Queens, either take the ferry, subway or walk or cycle over the Roosevelt Island Bridge. 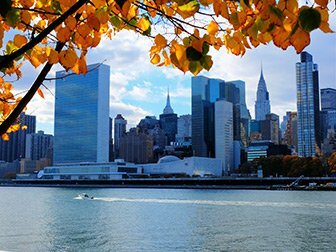 A visit to Roosevelt Island is a nice addition to your trip. Especially on a mild spring day when the blossom trees on the island are in bloom. 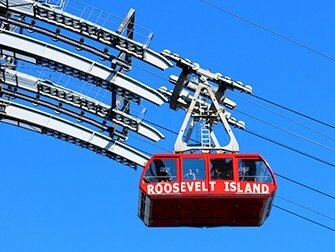 The most fun way to get to Roosevelt Island from Manhattan is to take the Roosevelt Island Tram. From this cable car you are treated to great views and the ride takes around three minutes. You can even pay with your MetroCard. Do you have an Unlimited Ride MetroCard? Then you actually ride for free! On the way back you can take the subway, which is the quickest way to get back to Manhattan. Although, it is more fun to take the NYC Ferry, as during the boat ride you have a lovely view of the skyline. Did you rent bikes to spend a few hours cycling around the city? You can actually take them with you on the ferry! For an additional $1 you can take your bike on the NYC Ferry and have a nice ride around Roosevelt Island. 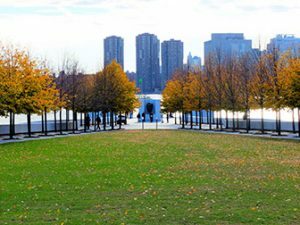 Although Roosevelt Island is fairly small, there are a couple of places that are well worth a visit. You can find most of these points of interest on the southern half of the island. To get there, just walk to the left when you get off the Roosevelt Island Tram. The other half of the island is residential, so less interesting. On the southernmost tip of the island you can find the Franklin D. Roosevelt Four Freedoms Park. This newly developed park comprises a large grass field bordered by walls and paths made of white granite. At the tip, there is a large bust of Franklin D. Roosevelt. It is free to visit and open six days a week from April to September between 09:00 and 19:00 and from October to March from 09:00 to 17:00 (closed on Tuesdays). Eric’s Tip: I personally like to grab something to eat in Manhattan, for example at Pick a Bagel on Lexington Avenue, and then take the cable car over to Roosevelt Island. There, I can enjoy my lunch with a view of the Manhattan Skyline. The perfect way to escape the hectic city for a while. Take the ferry back for a nice boat ride and fully relax before continuing on your New York adventure. 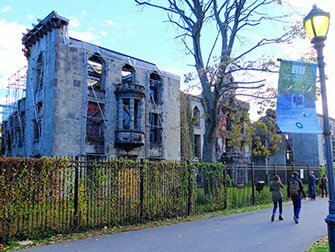 These days the Smallpox Hospital is an empty and spooky shell of what it once was. Named after the deathly sickness because it was the first hospital in the US that would take patients who had the disease. The ruins are surrounded by fences so you can only see it from the outside, but it is worth passing by when you are on the island for a visit. 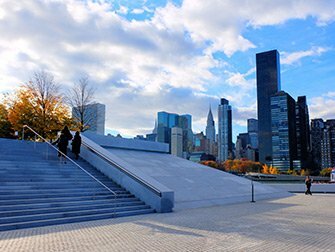 It is situated on the south side of Roosevelt Island, above the memorial, so you pass it as you leave the cable car headed for the memorial.